Brain optimization and radical life extension. Two medications to prevent or reverse age-related cognitive decline discussed at People Unlimited. What is your thought on brain health and radical life extension, is it related and is it important for your own longevity? 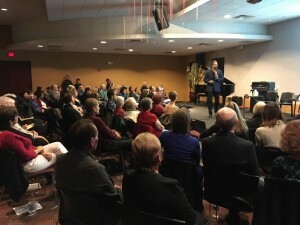 Ageless Education continued on Friday, December 2nd, with John A. Robinson NMD, returning to People Unlimited to discuss how to take our brains to the next level of peak performance. Dr. Robinson suggests a holistic approach of comprehensive health/wellness care, with a focus on pushing the limits wherever possible with non-toxic cognitive enhancers or nootropics. For those interested in radical life extension, in which we are actively engaged at People Unlimited, we need to stimulate and optimize brain health and eliminate cognitive decline related to age, especially the executive functions such as memory, creativity and motivation. Since the brain is the ultimate regulator of hormones and the immune system, the brain can affect every cell in the body; therefore a youthful brain may be the key to a youthful body. Dr. Robinson discussed two enhancers in particular that he considers to be radical life extenders – Deprenyl and Hydergine. Deprenyl is a prescription medication that prevents dopamine breakdown and protects neurons. Dopamine is a hormone that makes us feel motivated and is important for cognition, memory, focus and pleasure. Levels of dopamine decline every decade over 40, leading to Parkinson-like symptoms and general decline. The longer we can keep dopamine levels optimized, the longer we can live, and Deprenyl can help sensitize the receptors of Nrf2, activation of which reverses oxidative stress. For life extension purposes, Deprenyl is given in very low dosage. Hydergine is one of the most researched of all the cognitive enhancers and there is a lot of information that it lays down new brain cells and affects the brain’s energy utilization systems. It is FDA-approved in the treatment of senile dementia, Alzheimer’s disease and cerebrovascular disorders, but for life extension purposes it is used to prevent or reverse age-related cognitive decline such as memory, focus, recall and concentration. Dr. Robinson suggested to People Unlimited members that the synergy of both Deprenyl and Hydergine when used together seems to work the best for brain optimization and life extension enhancement in his experience. He reiterated that both are used in low doses, are extremely non-toxic and present very minimal side-effects.